화엄사 대웅전 앞에 동·서로 서 있는 쌍탑 가운데 서쪽에 자리하고 있는 탑으로, 동탑이 아무런 조각이 없는 반면 서탑에는 조각과 장식이 가득하다. 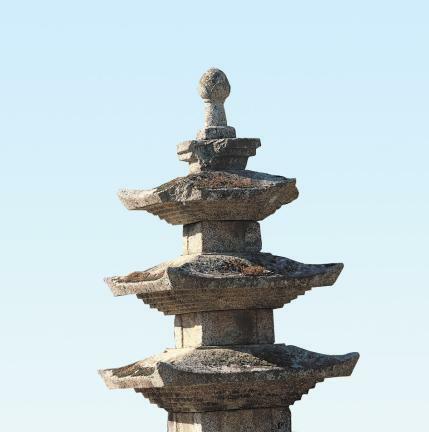 2단의 기단(基壇) 위에 5층의 탑신(塔身)을 세운 모습이다. 아래층 기단 각 면에는 안상(眼象) 속에 12지신상(十二支神像)을 방향에 따라 배치하였고, 윗층 기단은 각 면 모서리와 가운데에 기둥 모양을 본떠 새겼으며, 나뉜 두 면에는 8부신중(八部神衆)을 조각하였다. 탑신의 몸돌과 지붕돌은 각각 하나의 돌이며 몸돌에는 각 층 모서리에도 기둥 모양을 본떠 새겨 두었다. 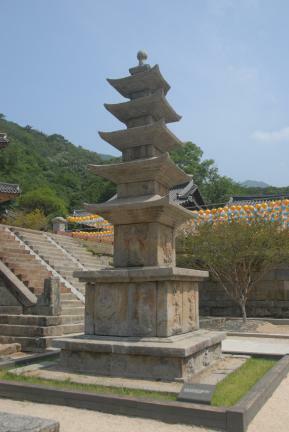 1층 몸돌 4면에는 4천왕상(四天王像)을 조각 배치하였다. 지붕돌은 각 층마다 밑면에 5단의 받침을 갖추고 처마밑은 수평이 되게 하였다. 머리장식으로는 2층의 단이 있는 받침 위로 보주(寶珠:연꽃봉오리모양의 장식)가 놓여 있다. 석탑의 형태는 높고 가파르면서도 상하의 체감비율이라든지, 지붕돌을 경쾌하게 처리한 수법 등이 잘 조화되어 우아한 기품을 지니고 있다. 특히 아래층 기단의 12지신상 조각은 석탑에서 흔하지 않은 예의 하나이다. 위·아래층 기단과 1층 몸돌 세 곳에 나타난 조각상은 그 배치에 보다 신중을 기하였고, 특히 12지신·8부중·4천왕 모두 불교의 수호신적 기능을 지닌 조형물이라는 점에서 탑 안에 모셔진 사리를 보호하려는 의도가 강하게 나타나고 있다. 조각상을 각 부분에 새긴 점이나, 지붕의 조형이 보다 유연한 느낌을 주는 점 등으로 보아 통일신라 후기인 9세기 경에 만들어진 것으로 짐작된다. 석탑 남쪽으로는 안상과 연꽃이 조각된 배례석이 놓여 있다. 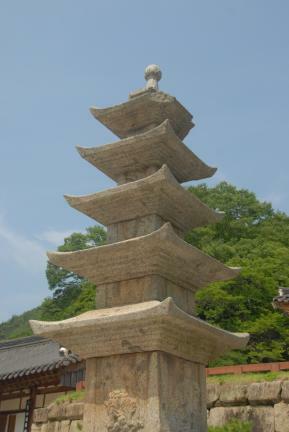 This five-story stone pagoda, one of the twin pagodas, is located in the west in front of the main sanctuary of Hwaeomsa Temple. 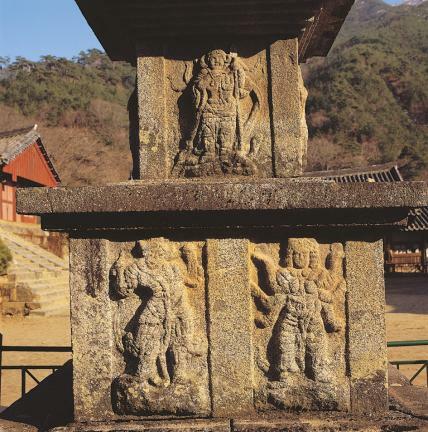 While the eastern pagoda has no sculptures, the western one is full of decoration and sculptures. 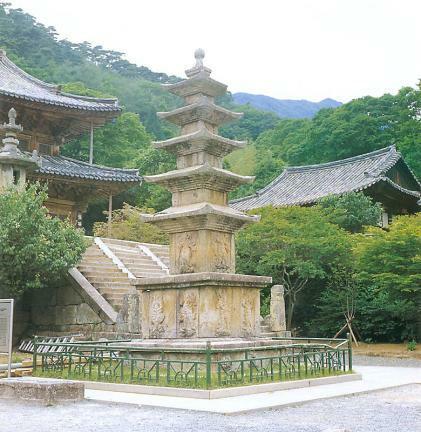 This pagoda consists of the two-tier stylobate and the five-story main body. 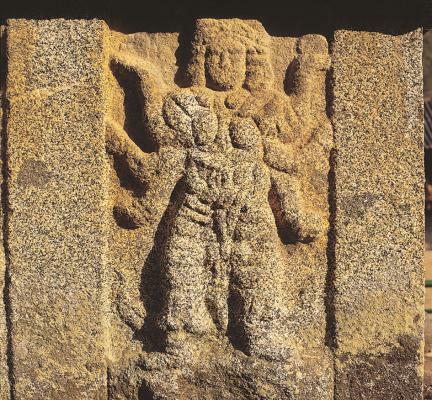 Engraved on each facet of the lower stylobate are panel decorations wherein the statues of twelve zodiacal animal deities were placed in each direction. 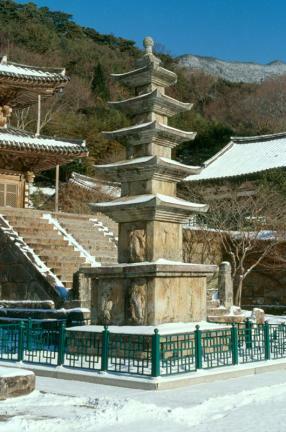 Carved at the corners and center of the facet of the upper stylobate is a pole pattern, so the facet is divided by two. 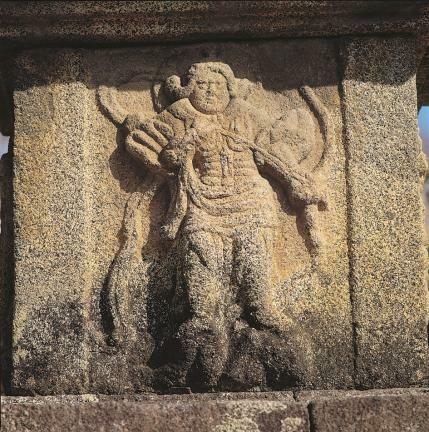 Standing statues of the Eight Guardian Warriors are carved by dividing into two facets. 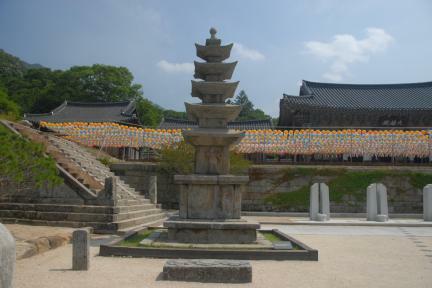 Each of the core stones and roof stones is composed of one stone, and the core stone for each story has small pole patterns at each corner. 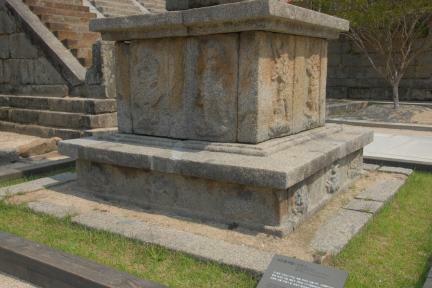 Carved and placed on the four facets of the core stone for the first floor are standing statues of the Four Guardian Kings. 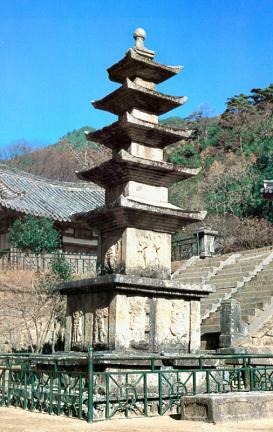 The roof stone is furnished with a five-step cornice at each story, and the eaves are horizontal. 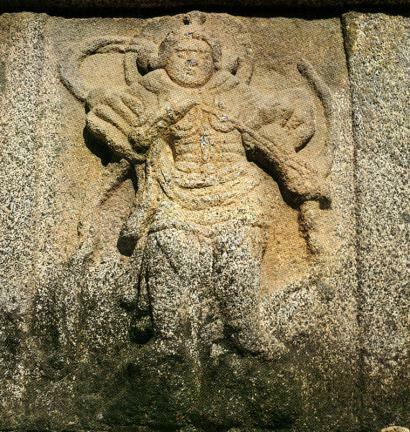 The top ornament has a two-layer prop; on top of that is a splendid bead shaped like a lotus bud. 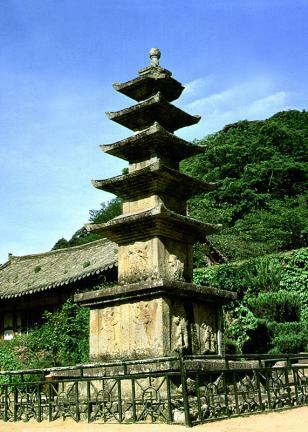 The pagoda has a form that gives a dignified impression, showing the light technique of the roof stone and the well-balanced decreasing ratio from top to bottom. 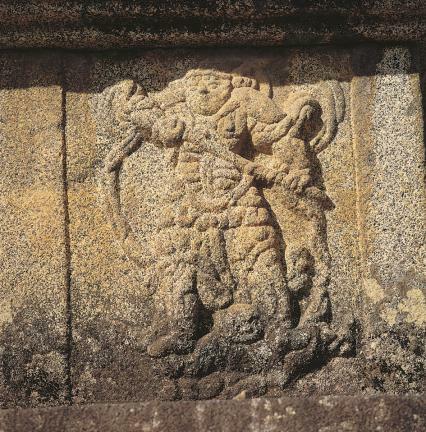 In particular, it is a rare case of having the lower stylobate sculpted with twelve zodiacal animal deities in stone pagodas. 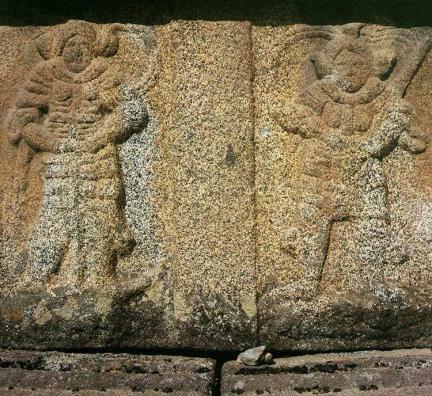 The carvings shown in the upper and lower stylobates and the core stone at the first floor were carefully arranged. 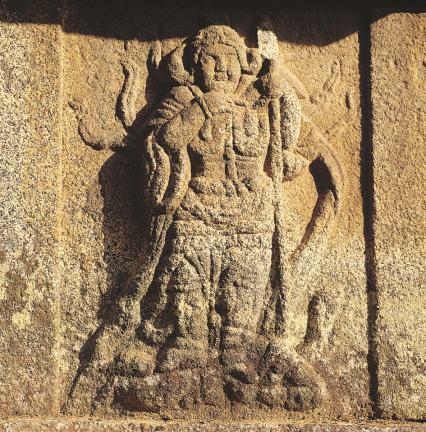 Especially, the engravings of twelve zodiacal animal deities and the Eight Guardian Warriors and the Four Guardian Kings, which all have the function of guardian spirit in Buddhism, were intended to protect the sarira enshrined in the pagoda. 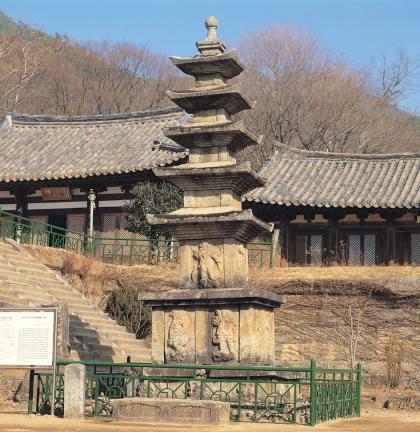 Judging from the carvings and the flexible construction of the roof stones, the pagoda is believed to have been built around the 9th century of the late Silla Era. 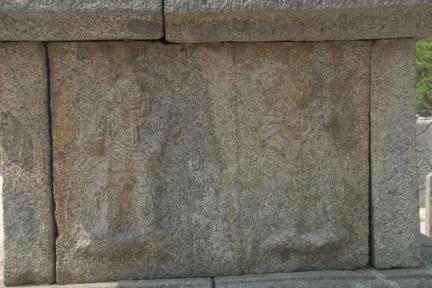 Standing south of the pagoda is the salutation stone with engravings of panel decoration designs on the side and lotus flower on the upper side.